Auth or Robert Matzen was recently featured on Time.com. The Hollywood historian and film lecturer was interviewed for a piece entitled Carole Lombard and Flight 3: A Movie Star's Mysterious Death. 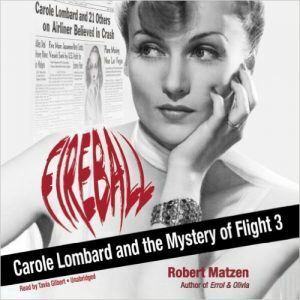 In the new trade paperback of Fireball: Carole Lombard and the Mystery of Flight 3, Matzen takes a deep dive into the life of Carole Lombard and the other passengers and pilot on Flight 3 with an expanded section of photos, many of them included in this gallery." Read the whole piece here. When focusing on book marketing, remember the value of press clippings to your book publicity efforts! Smith Publicity is one of the leading book marketing firms in the world, with offices in the U.S. and Toronto. Since 1997, we’ve represented more than 3,000 authors worldwide, from New York Times bestsellers to first-time, self-published authors in every genre. Our fundamental driving force—superior presentation, promotion, and positioning of our authors—has never changed. Our mission statement is simple. "Make Good Things Happen for Authors."